STEVE SHARP/Daily Times Dan Litchfield, director of renewable development for Invenergy in Chicago, spent some time Thursday morning at Watertown's Maranatha Baptist University for a breakfast meeting. Invenergy, an 18-year-old solar energy-harnessing firm interested in locating in Concord, directed one of its representatives to visit Watertown's Maranatha Baptist University Thursday morning for an informational meeting. Dan Litchfield, engineer and director of Invenergy Renewable Development, expressed what the company hopes to accomplish in the Concord area near the Rock River in the coming years. His bacon-and-eggs visit brought rapt attention and some insightful questions from the audience. Invenergy, headquartered in Chicago, is North America's largest privately owned renewable development company and the project developer of the proposed "Sinnissippi Solar Farm," a 300 megawatt solar farm installation the firm wishes to locate near County Highway E. The facility would be near the Rock River south of Watertown down to Concord. The firm is hoping to tie into the Concord generating station to provide its link to the power grid. 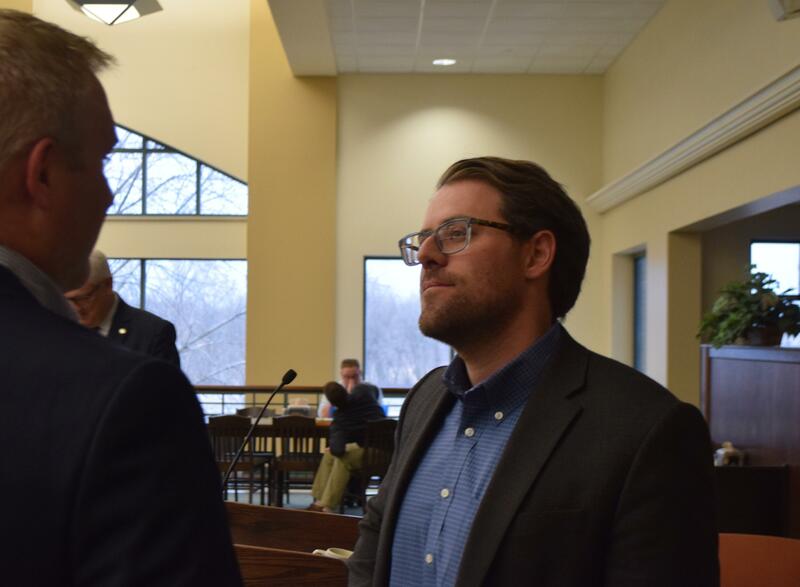 As Invenergy fights legal issues with an Iowa County facility, which Litchfield said is about to be approved, he discussed how solar can be of benefit to the Watertown area. Another such site is being proposed for the towns of Jefferson and Oakland, but that installation would be run by a different firm. "This is a new opportunity for this part of Wisconsin," Litchfield said. "The cost of producing energy from the sun has dropped dramatically and this trend is continuing. We can now produce energy in Wisconsin for less than buying coal." But why Wisconsin? Litchfield was asked. "The cost is down. There has been a large de-carbonization by utilities and a shift in the economy will offer a value to Watertown and Wisconsin," Litchfield. Litchfield hails from Ohio and works with Invenergy at One South Wacker Drive, Suite 1800, Chicago, Illinois. Litchfield said the northeastern part of the United States has already gotten on board with solar power and this part of the country is a good choice for such installments due to the perfect solar environment it offers. He said many people wonder why these types of facilities aren't placed in barren "no-man's-land" areas such as those in Arizona and New Mexico. Litchfield said Wisconsin is preferable, because of its closer connections to the power grids of the U.S.
"Solar is newer to our portfolio," Litchfield said, noting his firm has other energy enterprises it pursues, such as wind. "We like to create partnerships and renewable energy is now cost-competitive. We never have to pay for fuel," he said. The proposed Concord site might be 2,100 acres under intense use and 3,000 acres in total, with permitting ideally completed in 2020 and the facility being online in 2023. Invenergy likes to use 20- to 30-acre lots, if possible. Litchfield said the installation could be functional for 25-50 years. "This would be a long-term, but temporary, use of the land," he said. There could be 1 million panels in the installation and these would generate 300 megawatts of power, which would power 75,000 homes. According to his estimates, 10 panels would serve one home. "There would be no air emissions or water use," Litchfield said. "Operations are quiet and emit no odors." Litchfield's statement regarding sound has been disputed by some who are against solar installations. Detractors say they are noisy, as the panels move and track the sun all day. He said the solar panels will be "low profile" and each site on which they will be located will be part of natural habitat of native site vegetation. Sheep may even be used to graze the properties. "We fit with farming," he said, adding, "People are used to looking at rows of corn, but now it's solar panels and we have screening options. The noise issue is overblown ... These are inaudible." Litchfield said landowners who are coming on board with Invenergy have said the solar option is appealing because farm commodity prices have dropped and solar farming is a way to keep the farm and its lands within the family. To this end, he said, solar farms can actually build soil, reduce storm-water run-off, improve downstream water quality, offer grazing opportunities and can present options for pollinator habitat. Jefferson County board Supervisor Augie Tietz was present for the session and posed a few questions. Litchfield told Tietz the solar farm he and Invenergy are proposing would create jobs and add tax revenue. There would be long-term cash flow, he said. "This could mean tens of millions of dollars to landowners and this money could be spent locally," Litchfield stated. Litchfield said on-site staff would be about five people. "There would not be that many, but they would be highly skilled," he said. As for the time when the panels may become obsolete, Litchfield said there will be funding set aside for removal. "We use a low-risk business model," he said, noting there are many landowner protections available. "We don't anticipate bankruptcy or an abandonment of the facilities. This is cutting-edge technology." For local Invenergy contact, the public is invited to talk with Tammy Vetrano of Jefferson at 920-699-2900.